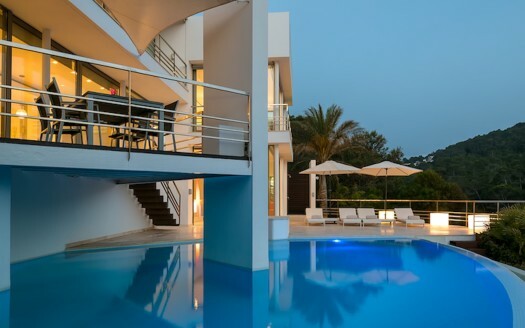 Villa Queen is an Exclusive Luxury Villa for rent in Ibiza. located very close to the charming village of San José, and Cala Jondal area (Ibiza). Minimalist design architecture, with high-end qualities. Total privacy with nice views to the countryside and the Sant Antoni bay with amazing sunsets. Full equipped kictchen, guest toilet. 90m2 Master Suite with amazing views: dressing, TV, large bathroom with 2×2 seaside jacuzzi, separate shower- 2 terraces. Pathway through the 22.500m2 of the property.